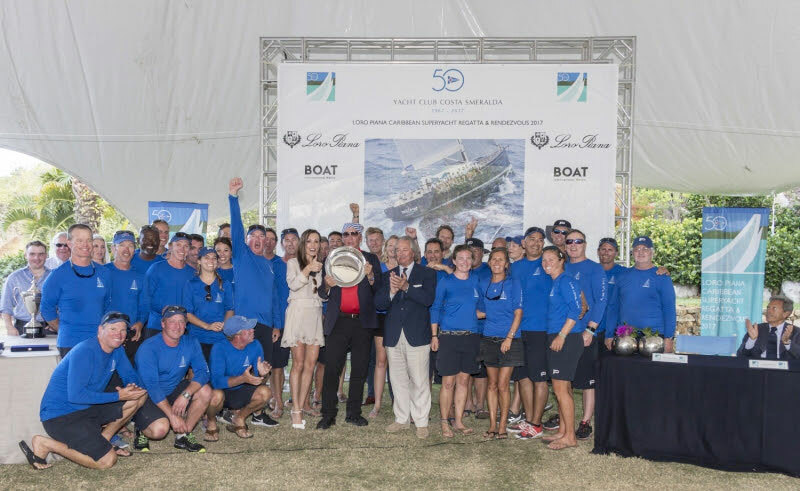 VIRGIN GORDA (March 13, 2017) – Nilaya, the dominating Reichel/Pugh design, was presented the Loro Piana Prize: Boat International Media Trophy for overall victory at the Loro Piana Caribbean Superyacht Regatta & Rendezvous. 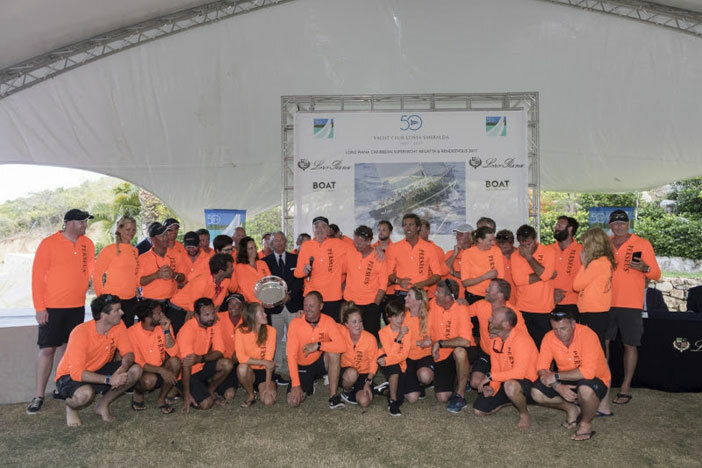 P2 Class B Winners, Loro Piana Caribbean Superyacht Regatta & Rendezvous 2017. The two were tied on points heading into today’s finale, but the P2 crew signaled their intention to take no prisoners this morning when they fired their cannon-a 39-inch barrel, 2-inch bore armament that was captured from the French frigate Le Medee in 1801-upon leaving the YCCS dock. When they fired it again after finishing, everyone in ear shot knew the job had been done. In Class D the 60m Perseus^3 completed its first class victory with a come-from-behind win. Perseus^3 suffered a problem with its roller furling system that prevented the crew from using the large headsail for half of the race’s upwind work. The crew was able to get the issue sorted out in time to score a 45-second win over Action, the new 123-footer from Dykstra Naval Architects and built by Royal Huisman. 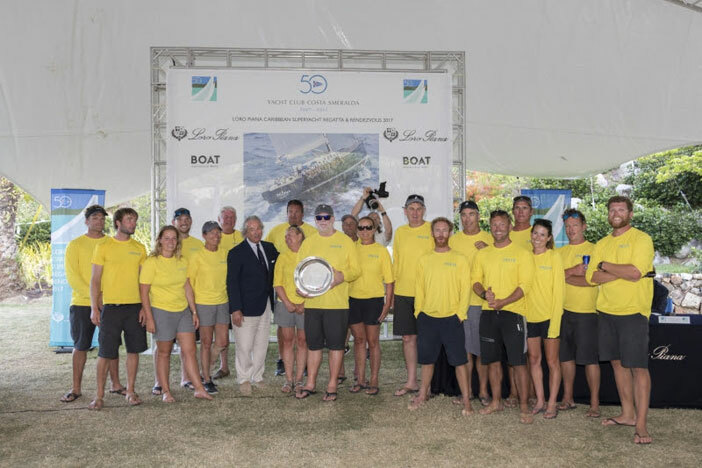 Freya Class C Winners, Loro Piana Caribbean Superyacht Regatta & Rendezvous 2017. 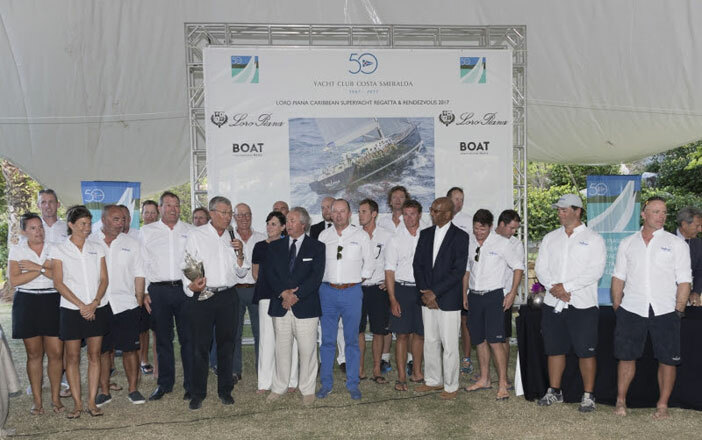 Perseus^3 Class D Winners, Loro Piana Caribbean Superyacht Regatta & Rendezvous 2017. The Yacht Club Costa Smeralda was founded in Porto Cervo, Sardinia in 1967 by current president H.H. the Aga Khan and a group of founder-members as a non-profit sporting association for fellow sailing enthusiasts. The YCCS is renowned for organizing international sailing events such as the Maxi Yacht Rolex Cup, the Audi Sardinia Cup and the Rolex Swan Cup as well as World and European championships for top one-design fleets. In recent years the Club has focused on promoting new superyacht events such as the Loro Piana Superyacht Regatta, the Dubois Cup and the Perini Navi Cup. The Club has also promoted international challenges such as Azzurra – the first Italian challenger for the America’s Cup in 1983 which became a legendary Italian brand and was relaunched by the YCCS in 2009 with a victorious participation in the Louis Vuitton Trophy in Nice – the participation in the Volvo Ocean Race with a two boat campaign one of which had an all-female crew, and the motor yacht Destriero which to this day holds the transatlantic crossing record set in 1992. The YCCS continues to expand its activities and in 2012 inaugurated its winter base in Virgin Gorda overlooking the island’s new YCCS Marina. The Club now runs regattas year-round on both sides of the Atlantic.